The players are disease-fighting specialists whose mission is to treat disease hotspots while researching cures for each of four plagues before they get out of hand. 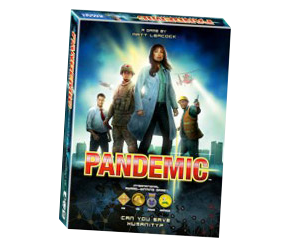 One of the first great co-operative games, Pandemic that sees players racing back and forth across the globe, against the clock, trying to halt the spread of horrible diseases! What fun! Rightly regarded as a classic and now in a very reasonably priced new edition with lovely little translucent disease cubes. The first edition summary includes all the rules from the expansion On the Brink. The second edition summary is currently for the core rules only. Each, of course, are customised with the appropriate graphics. Completely grateful for the effort you’ve put into this. The site looks great and the summaries are extremely helpful – thanks!!! Hi, just a question, this game aid was done for the “original” game right? If so, can this be directely aplied to the the “new” version of the game and the expansions? Yes it was. I don’t think any rules changes have been made, but I’m not 100% sure and can’t seem to find out on Boardgamegeek. Perhaps posting there will get you a more definite answer. The new edition adds in two new roles, and changes the name of one candian city, apart from that no non-artwork changes noticed. Thanks for that info. I may get the new edition, in which case I’ll update this sheet. What is the city name change? Z-Man actually sells a set of “replacement” 2nd ed. cards for $10. I’m going to buy those to upgrade my 1st ed. game. Didn’t know about the map change too. Montreal instead of Toronto. More info here. Great tools here…. any plans to get this Pandemic one updated to include In The Lab expansion? I hope so. I have a review of the new edition of Pandemic coming soon, and I’ll be updating this sheet. Expansion updates will no doubt follow. Amazing work as always. Can’t wait for the expansions, much appreciated. Love to see the expansions!